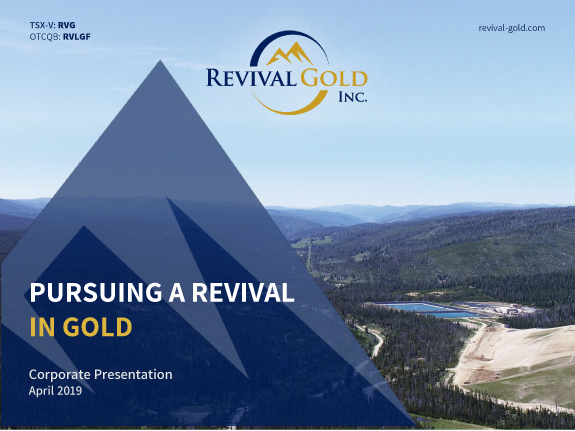 Revival Gold Closes $5 Million Brokered Private Placement - Revival Gold Inc.
Toronto, ON – April 4th, 2019 – Revival Gold Inc. (TSXV: RVG, OTCQB: RVLGF) (“Revival Gold” or the “Company”), a growth-focused gold exploration and development company, announces the close of its amended brokered private placement financing (the “Private Placement”). The Private Placement was announced March 13th, 2019 and consisted of the sale of 7,000,000 units of the Company (“Units”) at a price of $0.72 per Unit for gross proceeds of $5,040,000. Each Unit consists of one common share of the Company (a “Share”) and one half of a Share purchase warrant (each a “Warrant”). Each whole Warrant is exercisable into one Share at a price of $0.90 per Share for 36 months following close of the Private Placement. “Revival Gold is now funded to complete the next phase of exploration drilling and metallurgical test work as well as provide an updated resource estimate at the Beartrack-Arnett gold project over the course of the next 15 months”, said Hugh Agro, President & CEO. “The primary objective will be to grow near-surface oxide gold resources for which we can leverage existing heap leach infrastructure at Beartrack”. Paradigm Capital Inc. and Medalist Capital Ltd. acted as co-lead agents on behalf of a syndicate of agents including PI Financial Corp. and Beacon Securities Limited (collectively, the “Agents”) to complete the Private Placement. A commission was paid to the Agents which included a cash payment of $248,397 and the issuance to the Agents of 367,080 agents’ warrants exercisable into Shares at $0.72 per Share for a period of 24 months following close of the Private Placement. Additionally, in connection with the Private Placement, the Company paid cash finder’s fees of $17,280 to qualified finders. In connection with the Private Placement, Hugh Agro, President, Chief Executive Officer and a Director of the Company, Carmelo Marelli, a Director of the Company and Orion Mine Finance (“Orion”) (collectively “Insiders”), have acquired 859,200 Units in the aggregate. This issuance of Units to Insiders is considered a “related party transaction” as such term is defined under Multilateral Instrument 61-101 – Protection of Minority Security Holders in Special Transactions (“MI 61-101”). The Company is relying on exemptions from the formal valuation and minority shareholder approval requirements provided under MI 61-101 on the basis that the participation in the Private Placement by Insiders does not exceed 25% of the fair market value of the Company’s market capitalization. As part of the Private Placement, Orion has acquired, through Orion Mine Finance II LP, a limited partnership managed by Orion Mine Finance Management II Limited, 700,000 Units at a price of $0.72 per Unit for an aggregate purchase price of $504,000, making its holdings in the Company 7,300,500 Shares (assuming the exercise in full of the Warrants). The issuance of 700,000 Units to Orion represents the acquisition of approximately 2.41% of the number of Shares issued and outstanding immediately prior to the closing of the Private Placement calculated on a partially-diluted basis (assuming the exercise in full of the 350,000 Warrants being issued to Orion in the Private Placement). Immediately following the closing of the Private Placement, Orion will own approximately 14% of the total issued and outstanding Shares calculated on a partially diluted basis. Immediately prior to the Private Placement, Orion held 4,167,000 Shares and 2,083,500 Warrants, representing approximately 14% of the total issued and outstanding Shares calculated on a partially diluted basis (assuming the exercise in full of Orion’s Warrants). The Units were acquired by Orion for investment purposes. Orion has no current plan or future intentions which relate to, or would result in, acquiring additional securities of Revival Gold, disposing of securities of Revival Gold, or any of the other actions requiring disclosure under the early warning reporting provisions of applicable securities laws. Depending on market conditions, Orion’s view of Revival Gold’s prospects and other factors considered relevant by Orion, Orion may acquire additional securities of Revival Gold from time to time in the future, in the open market or pursuant to privately negotiated transactions, or may sell all or a portion of its securities of Revival Gold. For the purposes of this notice, the address of Orion is Cumberland House, 7th Floor, 1 Victoria Street, Hamilton HM11, Bermuda. In satisfaction of the requirements of the National Instrument 62-104 – Take-Over Bids And Issuer Bids and National Instrument 62-103 – The Early Warning System and Related Take-Over Bid and Insider Reporting Issues, an early warning report respecting the acquisition of Units by Orion will be filed under the Company’s SEDAR Profile at www.sedar.com. A copy of the early warning report regarding Orion’s acquisition can be obtained by contacting Rick Gashler at 212-596-3497. Revival Gold currently has 49,515,258 Shares outstanding. The securities issued pursuant to the Private Placement are subject to a four month and one-day statutory hold period. The securities have not been, and will not be, registered under the United States Securities Act of 1933, as amended (the “U.S. Securities Act”), or any U.S. state security laws, and may not be offered or sold in the United States without registration under the U.S. Securities Act and all applicable state securities laws or compliance with requirements of an applicable exemption therefrom. This press release shall not constitute an offer to sell or the solicitation of an offer to buy securities in the United States, nor shall there be any sale of these securities in any jurisdiction in which such offer, solicitation or sale would be unlawful. This News Release includes certain “forward-looking statements” which are not comprised of historical facts. Forward-looking statements include estimates and statements that describe the Company’s future plans, objectives or goals, including words to the effect that the Company or management expects a stated condition or result to occur. Forward-looking statements may be identified by such terms as “believes”, “anticipates”, “expects”, “estimates”, “may”, “could”, “would”, “will”, or “plan”. Since forward-looking statements are based on assumptions and address future events and conditions, by their very nature they involve inherent risks and uncertainties. Although these statements are based on information currently available to the Company, the Company provides no assurance that actual results will meet management’s expectations. Risks, uncertainties and other factors involved with forward-looking information could cause actual events, results, performance, prospects and opportunities to differ materially from those expressed or implied by such forward-looking information. Forward looking information in this news release includes, but is not limited to, the Company’s intentions regarding the use of proceeds of the private placement, objectives, goals or future plans and statements. Factors that could cause actual results to differ materially from such forward-looking information include, but are not limited failure to obtain final regulatory approval for the Private Placement, failure to identify mineral resources, failure to convert estimated mineral resources to reserves, the inability to complete a feasibility study which recommends a production decision, the preliminary nature of metallurgical test results, delays in obtaining or failures to obtain required governmental, environmental or other project approvals, political risks, uncertainties relating to the availability and costs of financing needed in the future, changes in equity markets, inflation, changes in exchange rates, fluctuations in commodity prices, delays in the development of projects, capital, operating and reclamation costs varying significantly from estimates and the other risks involved in the mineral exploration and development industry, and those risks set out in the Company’s public documents filed on SEDAR. Although the Company believes that the assumptions and factors used in preparing the forward-looking information in this news release are reasonable, undue reliance should not be placed on such information, which only applies as of the date of this news release, and no assurance can be given that such events will occur in the disclosed time frames or at all. The Company disclaims any intention or obligation to update or revise any forward-looking information, whether as a result of new information, future events or otherwise, other than as required by law.